Oil prices are struggling to find a bottom, moving up on Monday but floundering in early trading on Tuesday. 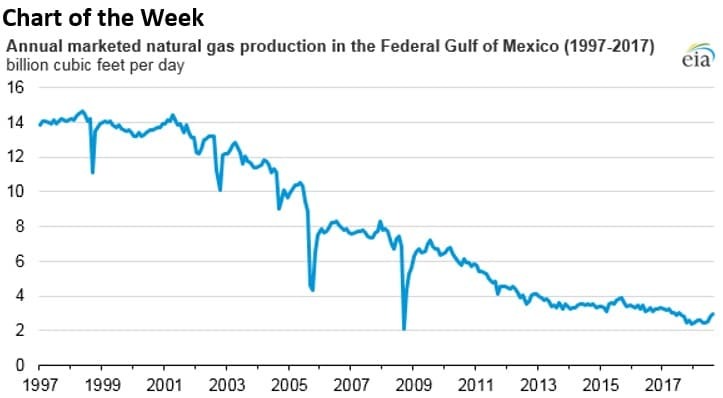 - Natural gas production in the Gulf of Mexico has been declining for two decades. But 10 new projects are expected to begin operations in 2018, according to the EIA, followed by another 8 in 2019. - These 18 projects have a combined resource estimate of 836 billion cubic feet. - Together, they could allow Gulf of Mexico gas production to rebound. • Cheniere Energy (NYSE: LNG) has produced just about enough LNG at its Corpus Christi export terminal to ship its first cargo, according to S&P Global Platts. • Kosmos Energy (NYSE: KOS) fell nearly 3 percent after-hours on Monday when it announced the sale of 15 million common shares in a secondary public offering. • Total SA (NYSE: TOT) announced a shutdown of its 253,000-bpd Gonfreville refinery in Normandy because of a strike. Saudi Arabia pushes for “quiet cut.” A few weeks ago, rumors floated of a potential aggressive production cut at the upcoming OPEC+ meeting, perhaps as large as 1.4 million barrels per day. However, that now looks unlikely, as President Trump has simultaneously protected Saudi Arabia from international outrage over the Khashoggi murder, at the same time that he has pressured them into keeping oil prices low. Russia is also not keen on a large production cut. 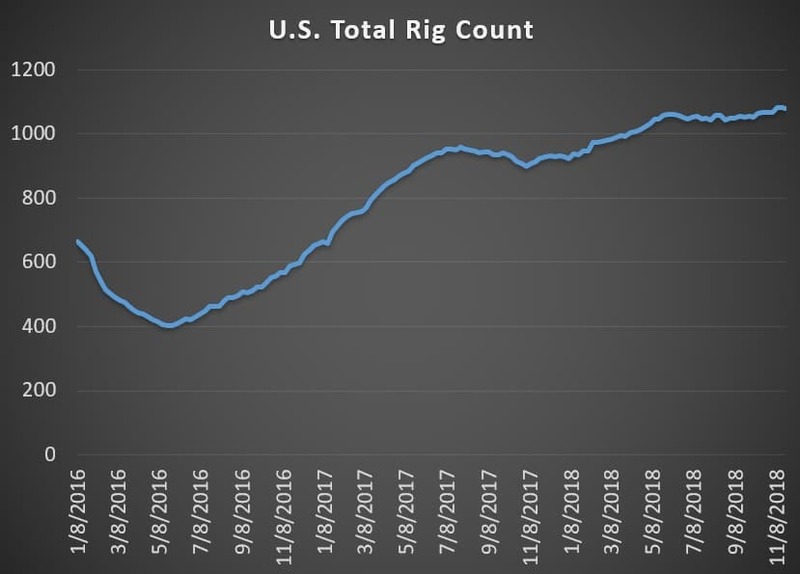 That leaves Saudi Arabia looking for a “quiet cut,” which would mean taking production back down to previously agreed upon production limit – around 10 mb/d, down from the current 11 mb/d. Trump wants low oil prices, but U.S. shale could take a hit. The pressure campaign by the White House to deter OPEC+ from cutting production could succeed in keeping crude prices low, but prices are approaching a level that could damage U.S. shale companies. “We're at the point where we're nearing full cycle break-evens for Permian producers and depending on how long this lasts, we might see an impact on capex budgets over the next few months,” Muhammed Ghulam, senior research associate at Raymond James, told CNBC. Related: Could Oil Prices Fall To $40? Saudi Aramco eyes $500 billion makeover. Saudi Aramco’s CEO told Bloomberg that the company will spend $500 billion over the next decade to transform itself into a major refiner and petrochemical maker, not just an oil producer. “Saudi Aramco will make the most of those prospects with global investments in the chemicals space of roughly $100 billion over the next 10 years -- in addition to prospective acquisitions,” Aramco CEO Amin Nasser said. In total, Nasser outlined $500 billion in spending plans. Long-term oil demand is looking increasingly fragile, but the petrochemical sector is where most demand growth will be concentrated, according to the IEA. Russia-Saudi oil alliance faces a test. Saudi Arabia is clearly itching for a production cut at the OPEC+ meeting next week, but Russia is much more hesitant. Russian oil firms are opposed to curtailing output, and the Russian economy does not benefit as much from higher prices than the Saudi economy does. Still, President Vladimir Putin has strategic reasons to keep up the partnership with Saudi Arabia. But after the production increases in June backfired, Moscow and Riyadh are not exactly on the same page anymore. Venezuela reaches deal with Crystallex. Canadian mining company Crystallex has been trying to force Venezuela’s PDVSA to sell Citgo as compensation for an expropriated gold mining project back in 2011. However, Venezuela and Crystallex just struck a deal that will allow PDVSA to hold onto Citgo. Under the terms, Venezuela paid an initial $425 million to Crystallex, and will pay the remaining balance in installments through 2021. Venezuela rejects BP offer. BP (NYSE: BP) reportedly proposed buying Total SA’s (NYSE: TOT) stake in a moribund natural gas project in Venezuelan waters. The project is located along the maritime border of Venezuela and Trinidad and Tobago. BP owns the rights to the Trinidadian side and wanted to buy Total’s stake on the Venezuelan side, and could use the gas to expand operations in Trinidad. Caracas blocked the offer, according to Reuters. Goldman Sachs: Oil shortage in 2020s. The oil market may be oversupplied now, but Goldman Sachs says a shortage is coming in the 2020s. 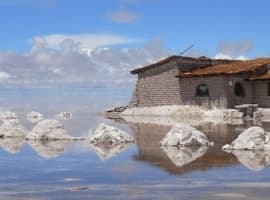 “In the 2020's we are going to have a clear physical shortage of oil because nobody is allowed to fully invest in future oil production,” Michele Della Vigna, Head of EMEA Natural Resources Research at Goldman Sachs told CNBC Friday. Nigeria lost $6 billion to Shell and Eni. A new report finds that Nigeria missed out on nearly $6 billion in projected revenues because of the odd structure of a 2011 oil deal it made with Royal Dutch Shell (NYSE: RDS.A) and Eni (NYSE: E). The deal is now in focus because of a corruption trial in Milan, where Eni executives are in the hot seat. France and Germany move to keep business with Iran alive. The EU previously proposed to setup the special purpose vehicle (SPV) to allow European companies to continue to do business with Iran, working around U.S. sanctions. France and Germany have agreed to jointly host the financing arrangement, and are taking aggressive moves to try to keep the Iran nuclear agreement alive even as the U.S. continues to pressure European capitals not to move forward. U.S. pressures Iraq to break from Iran. The U.S. is trying to pressure Iraq to wean itself off of Iranian energy, according to the Wall Street Journal. Iraq depends on Iran for natural gas, which is used to generate electricity. The U.S. granted Iraq a 45-day waiver on sanctions on gas imports, but Iraq says it will need more time. Iraq warns that the U.S. could destabilize the country if it presses too hard. China imports from Russia amid Iran sanctions. China cut oil imports from Iran ahead of U.S. sanctions, and instead is leaning more on Russia. China’s imports of Russian oil hit a record high in October. Chevron announces first oil from Gulf of Mexico project. Chevron (NYSE: CVX) announced first oil from its Big Foot project in the Gulf of Mexico last week. The project is located 225 miles south of New Orleans and has a projected lifespan of 35 years. France fuel protests. France has seen a second week of protests over a proposed tax hike on diesel. Diesel prices have climbed around 20 percent this year in France, although that is largely due to the increase in crude oil prices (until recently). The tax is intended to harmonize gasoline and diesel prices – diesel has long been undertaxed relative to gasoline in France. Trump maintains hard line on China. Trump is set to meet with Xi Jingping this week, but on Monday he suggested that he would move forward with a tariff hike in January. The 10 percent tariff on $200 billion of Chinese imports is set to jump to 25 percent at the start of 2019. Trump said it was “highly unlikely” that he would hold off on that increase. He also said he was ready to move forward with additional tariffs on another $267 billion of Chinese goods if the two leaders don’t reach an agreement this week. Wall-Street banks crashed oil. These banks sell options and most recently when the buyers were very close to being in the money with their hedges, the Wall-Street Banks rapidly sold oil futures to crash prices and never let the option strike price materialize. Otherwise the banks would have to pay up on the buyers hedge. Theses options expire at the end of December so after that, oil will be back to 85. This is the corrupt oil markets brother so keep it real. Saudi is a mere vassal state of the USA big oil names and they have always been mere USA puppets with yachts. Carry on now and have a great day. Despite analysts projecting cuts by OPEC ranging from 1 million barrels a day (mbd) to 1.5 mbd in its December meeting, nobody should bank on OPEC deciding to cut production. The overwhelming OPEC members could be against any new cuts. Instead, they will demand that Saudi Arabia and Russia withdraw the 400,000 b/d and 250,000 b/d they respectively added to the market and return them to the original 1.8 mbd cut under the OPEC/non-OPEC agreement. In so doing, the glut in the market will ease. Libya will also have to cap its production at 1.2 mbd if it is to continue to be exempted from the production cut agreement. Having made a grave mistake in June by adding 650,000 barrels a day (b/d) to the market, Saudi Arabia and Russia are in no a position to ask OPEC members for new cuts. And while there has been a delay in finalizing the so-called Special Purpose Vehicle (SPV) (or barter trade) for bypassing US sanctions on Iran, nobody should underestimate the steadfastness of the European Union (EU) in not complying with US sanctions on Iran and the continuation of trade with it. Now France and Germany have agreed to jointly host the SPV and are taking aggressive moves to try to keep the Iran nuclear agreement alive even as the US continues to pressure European capitals not to move forward. We must remember how Angela Merkel defied President Trump’s threat of sanctions against Germany if she doesn’t abandon Nord Stream 2 gas pipeline. The EU has no alternative but to support the nuclear deal and therefore continue to trade with Iran. The alternative is a collapse of the nuclear deal and a return of Iran to full nuclear activities which could lead to war between the US and Iran supported by the likes of Israel and Saudi Arabia. President Trump will be ill-advised to take a hard line on China on the eve of his meeting with the Chinese leader Xi Jingping by suggesting that he would move forward with a tariff hike in January. He should realize by now that China will never kowtow to him and that he will never win a trade war against China. If China was prevented from selling $800 billion worth of goods in the US market because of rising US tariffs, it could easily sell them somewhere else as its economy is much bigger and more integrated in the global trade system that the US economy. Replacing Chinese exports with more expensive imports from other countries will increase the costs to American consumers, add to US budget deficit, raise inflation and expand US outstanding debts of $22 trillion by 2.35%. In such a situation, the US will be the loser in a continuation of the trade war. Moreover, the whole US sanction regime against Iran is at the mercy of China and the petro-yuan. China could singlehandedly nullify US sanctions by buying the entire Iranian crude oil exports estimated at 2.2 mbd and paying for them in petro-yuan. For the time being, China is slowly increasing its purchases of Iranian crude. But if no breakthrough is achieved over the escalating US trade war on China during the coming meeting between the two leaders, you can bet that China will just do exactly that in retaliation against the US.